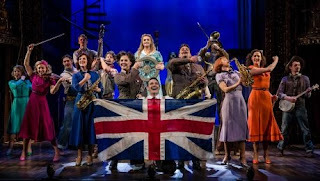 No, literally…who COULD ask for anything more when this charming production evokes just the right amount of ‘old school’ pizzazz as it showcases the classic melodies of George and Ira Gershwin in a refreshed yet innovative touring adaption. At first glance, Crazy for You presents itself as the epitome of Golden Age of Musical Theatre. However, theoretically this is a musical from the 1990s and arguably the earliest of ‘jukebox’ productions, encompassing standalone numbers from over 80 years ago. As far as narratives go, Crazy for You follows Bobby Child, a young man wanting to dance rather than work for the family bank. He is instructed to go to Deadrock, Nevada to foreclose a rundown theatre and reluctantly heads off, only to fall in love with Polly Baker – a young, headstrong lady who wants to save the long-held family theatre. Bobby is inspired to help Polly and sets out to put on a show disguised as the renowned theatre practitioner, Bela Zangler. It’s clear to see, Crazy for You is famed for the music…not its plot line! Headliner Tom Chambers (of Strictly fame) gives a well-rounded performance as the haplessly cheerful Bobby Child. Despite a couple of strained vocals, Chambers is a dexterous dancer who truly commits to his physically demanding portrayal, giving an infectious performance that highlights exactly why he was crowned the winner of Strictly Come Dancing in 2008. The true star of the show, however, is Chambers' right-hand woman - the delightful Charlotte Wakefield in the role of Polly Baker. Wakefield’s endearing and spunky interpretation of the optimistic Polly Baker is an utter joy to watch, supporting a magnificent vocal that fortunately balances out Chamber’s musical shortcomings. Her renditions of the classic Someone to Watch Over Me and But Not For Me being two of the show’s highlights. Kudos must also go to Claire Sweeney as the sassy yet seductive Irene Roth, Stacey Ghent and Kieran Kuypersas the ‘spiffing’ comedic duo Patricia and Eugene Fodorand Neil Ditt as the real Bela Zangler. Their individual performances were well thought out, committed and dynamic, supporting the narrative superbly. Director Paul Hart, Musical Supervisor and Arranger Catherine Jayes and Choreographer Nathan M Wright must be commended for their collaborative efforts in presenting this Broadway classic with a true contemporary edge. Although the actor-muso element let the overall production value down on occasion; the way in which the ensemble immersed themselves into the piece was effortless and commendable. Whether a poised dancing foot, a cello in hand or belting a harmony line, the 2018 revival cast gracefully give an otherwise eccentric narrative new energy and verve. 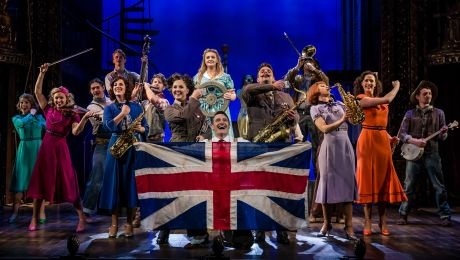 Overall, Crazy for You is a stellar production that certainly won’t leave you ‘bidin’ your time’ – with feel good showstoppers, light hearted characterisations and the classic ‘boy gets girl’ plot, this is a much loved ‘old school’ favourite that will have you tapping in the aisles and singing all the way home. Crazy for You is at the Edinburgh Playhouse until Saturday 7th April. For tickets visit the Edinburgh Playhouse.